Smart grills and grilling accessories can keep your backyard party going down the right path. Weber offers the iGrill smart thermometer for many of its models, like this Spirit 2 grill. Image: Digitized House Media. Summer is a time filled with celebrations, such as birthday parties, weddings, and family reunions. If you’re hosting such an event, you may feel the stress of all the responsibility resting on your shoulders. You want everything to run smoothly, but you aren’t quite sure how to avoid the many pitfalls of event planning. The two most popular months for weddings are June and August, with July closely following. So, you might also be planning a backyard wedding, and need some special equipment and rentals. However, even if you’re just having a few friends or relatives over for an outside barbecue, the gadgets below can make your life a bit easier. Thinking ahead to some of the most common problems you’ll run into as a host allows you to seek high-tech solutions before those problems occur. You’ll wind up with more than just a smart house—you’ll also host a smart event. Do you have a tendency to get distracted while grilling in the backyard and forget to flip your food? With today’s high-tech grills, scorched food may never happen again. Some new-tech grills, such as the Char-Broil SmartChef, offer an app that works with your smartphone to remind you when it’s time to flip your burgers. If a new grill is not in the cards for your backyard, smart accessories like the FireBoard Thermometer can also show off your chef skills a bit by enabling voice recognition—letting you know how long you’ve been grilling that prized steak or the precise interior temperature of the food by issuing an Amazon Alexa command. The Weber iGrill 3 thermometer is yet another add-on option and works with select Weber grills. Throwing a backyard evening event? A little mood lighting goes a long way toward setting the tone of the evening, and the cost is minimal. There are a number of options for smart outdoor lighting. For example, you can light a path with Sylvania’s Gardenspot lights. These communicate with your smart home network via Zigbee using a hub such as Wink or Amazon Echo Plus. If you decided to throw a wedding down by the lake, the last thing you want is extension cords running all over the place. Renting or buying a small power generator, such as the Honda EU2200i, is a good option that gives you lighting where you want it and without the concerns of a power outage ruining your big day. Many of these generators are very quiet and can run for hours on small tank of fuel. And did you know you can also rent a portable air conditioning unit to keep an enclosed tent cool during the hottest days of summer? Don’t fret if a power outlet is not available at your next outdoor event. Small power generators, like this Honda model, can provide plenty of power while making little noise. Image: Digitized House Media. What would an outdoor celebration be without amazing music? Who needs to hire a DJ when you can program a Bluetooth speaker to work with a playlist you personally chose to keep your guests dancing late into the night? There are a huge number of options available for portable Bluetooth-compatible speakers. If you already have an Amazon Echo Dot speaker, you can add a battery base to power the speaker for up to 9 hours, all the while using Alexa commands to mix music on the fly. It can be almost impossible to keep your fine wine at the perfect temperature during a summer dinner party—unless you own a high-tech gadget that allows you to set and forget the bottle of wine, keeping it chilled right where it needs to be. Vinglace is one example of a smart bottle capsule with refrigerator-like traits. 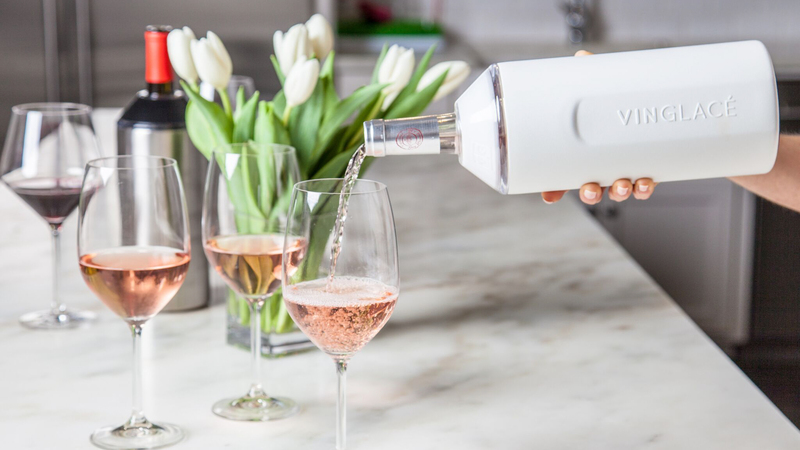 The product is portable and simply snaps into place over any standard wine or champagne bottle, so even if you aren’t the one hosting, you can still take the device along with you to cool and cuddle your personal bottle. More so than any other beverage, wines deserve to be served at an optimum temperature. In the heat of backyard gatherings, wine temperature control accessories like Vinglace can keep your wine cooled to just the right degree and keep guests smiling. Image: Vinglace. Today’s coolers can do much more than simply keep food chilled. Bring the Coolest Cooler to a picnic, and you’ll also get a blender and a Bluetooth-capable speaker system. There is also a built-in USB charger for your phone or other devices and a bottle opener is included as well. They’re the bane of every outdoor event—flies and mosquitoes. What if you could do away with these pests before they attack your guests? Today’s bug zappers are much smarter than the lighted, noisy zappers of your youth. Not only are they decorative and blend in nicely with the rest of your outdoor decor, but items such as the INADAYS Inatrap electronic insect killer are also smart enough to simulate the same body temperature as a human and lure mosquitos with CO2. Thanks to camping enthusiasts, you can find a portable version of nearly anything you might imagine. This means summer celebrations can occur anywhere at any time. Some of the portable items available include espresso makers, inflatable solar lanterns, and solar charging stations. Anything that makes entertaining easier is a step in the right direction. As technology continues to improve, expect more and more smart gadgets to hit the market and sync up with your smart home devices and smartphones. Who knows? One day there may be a virtual party planner device that plans and executes the party for you. Holly Welles is a home improvement writer helping others figure out homeownership and optimize their living spaces. She’s also the blogger behind The Estate Update (http://www.theestateupdate.com) and can be followed on Twitter at the link below.